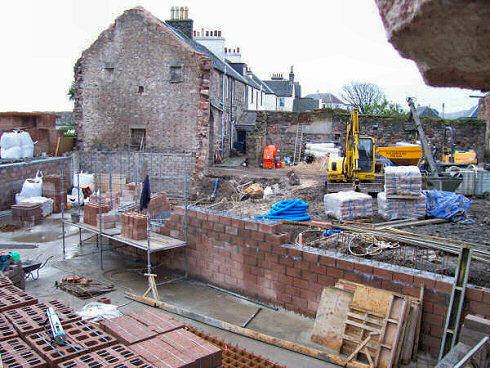 Above is a view from the ‘back’, from where the courtyard is going to be. The plan is to build a main building along the road (pretty much where the old building was) and have an outbuilding at the back. 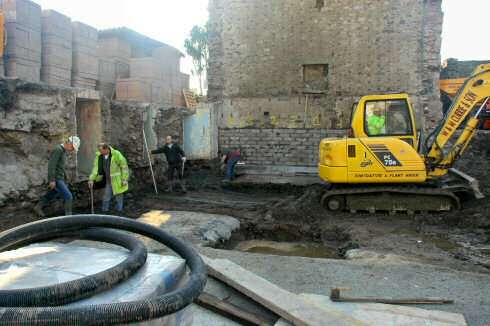 In the centre will be a courtyard or a garden, the restaurant and the patio will back on to the garden. The garden will almost be like a walled garden, surrounded from all sides. Some people would have liked the old walls, the old building to remain and just being refurbished internally. Talking with Roland he told me this just wasn't a viable option, the walls were so damp after all the years of neglect and the building not having a proper roof for a long time. Above you can see how they had to take out the basement walls to rebuild them and laying the foundations. The plan is to create a building with modern interiors (e.g. well sound proofed, using underground heat pumps etc) while giving the outside a traditional look that integrates well into the surrounding buildings. 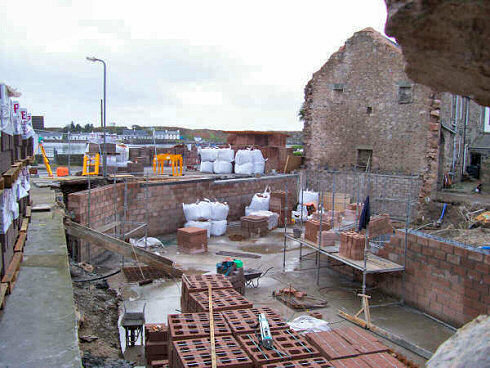 As you can see the walls have almost reached ground level again. 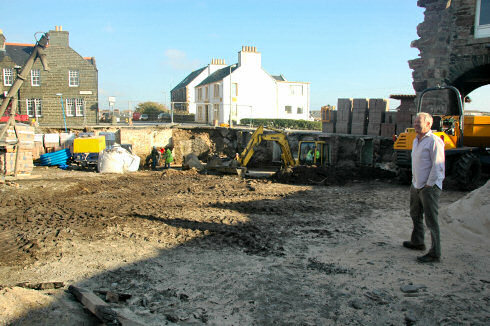 Note the square shaped area on the ground towards the left, this is where the lift is going to be. To my knowledge the only lift on Islay (well, there's one on the ferry, but that doesn't really count). Finally a quick return to the name of the hotel: As I said it won't be Islay Hotel, I don't think it will Port Ellen Hotel either. I believe only two people know the name for now. The reason being that there will be a competition around the name, all of this will become much clearer once Spot the Barrel will go live. Spot the Barrel isn't only about the name, but much more. And the prizes are impressive, some quite unique. I don't know the exact date, but to my knowledge it should go live very soon. So watch the site, I'll also blog about it as soon as possible after it goes live.